This book is a guide on how to fulfill our most basic human role of harmonizing Heaven and Earth from the perspective of classical Chinese medicine, offering a radically different way of looking at, being in, and interacting with the world from the perspective of ancient Chinese medicine, philosophy, and cosmology. Dr. Wilms combines her elegant literal translations with a wide selection of medical commentaries and quotations from philosophical and cosmological texts, as well as her personal insights, based on three decades of sinological scholarship and many years of teaching Chinese medicine students. Intended as an introduction to authentic classical Chinese medicine and philosophy, it aims to translate ancient Asian wisdom on living in harmony with the universe for contemporary readers. With this product, you earn 41 loyalty point(s). Sabine Wilms is one of our treasures. She has translated more than a dozen Chinese medical books from classical and modern Chinese sources into English, including compendiums such as volume five of Sun Simiao's Bei Ji Qian Jin Yao Fang, 備急千金要方 (Essential Prescriptions for Every Emergency worth a Thousand in Gold) and the Shen Nong Ben Cao Jing, 神農本草經 (Divine Farmer's Classic of Materia Medica). Her work has expanded our reach into the world of our ancient lineage considerably. However, her most recent text, Humming with Elephants, is my favourite. This is not only because of the subject matter, the depth of the material and its readability, but also because it is one of the most important translations ever to come out. This is because of her method of translation. Humming with Elephants is a translation-with-commentary on Chapter 5 of the Nei Jing Su Wen (Inner Classic Basic Questions). The chapter is variously translated as the 'Comprehensive Discourse on Phenomena Corresponding to Yin and Yang' (Unschuld), 'The Manifestation of Yin and Yang from the Macrocosm to the Microcosm' (Ni) or 'The Great Treatise on the Correspondence of Phenomena to Yin Yang' (Rochat de la Vallee). The Chinese name for this chapter is Yin Yang Ying Xiang Da Lun, 陰陽應象大論. Wilms translates this as 'The Great Treatise on the Resonant Manifestations of Yin and Yang.' The title of her book, Humming with Elephants is a play on the two words, ying 應 and xiang 象. Ying 應 can mean 'to resonate with', 'to correspond to', 'respond to', or, even, with a whimsical stretch of the imagination, 'to hum with'. Sabine gives us a wonderful explanation for this translation of ying, touching on her own path of healing, her moments by the sea or playing chamber music as well as quoting the Yue Ji 樂記 (Record of Music) chapter in the Li Ji 禮記 (Record of Rituals). In this, even in her choice of title, she teaches and expands us. She teaches us about Chinese language, history and medicine, while inviting us to make this personal. But this is just the beginning of how she instructs throughout the text. Xiang, 象, translated as 'manifestation' in the text, literally means elephant (see graphic) - hence the title, Humming with Elephants. With this title, we are instantly introduced to the whimsical, creative and poetic nature of the text at hand. Any translation of a classical text, to be complete, must include commentary by wise predecessors. Why? Because the meaning of the text is not straightforward. Many scholar-physicians throughout the ages have made decisions as to what the text means to them and they have explained why they take this meaning to be true. The scholar-physicians agree, disagree, expound and expand upon the words of each other. This is one reason why Liu Guohui's Discussion of Cold Damage is one of my main go-to texts for understanding the Shang Han Lun. Guo includes many doctor's viewpoints regarding each clause (and often individual characters) in the text. On their own, these texts are cryptic and seemingly obscure. We cannot really know what the lines mean without this commentary, without understanding the way the terms have been wrestled with and applied throughout history. In Heaven, there are the Four Seasons and Five Dynamic Agents. By means of these, birth, growth, harvest, and storage take place. By means of these, Cold, Summerheat, Parching, Dampness, and Wind are engendered. In Humans, there are the Five Zang Organs, which transform the Five Qi and by means of these engender happiness, anger, grief, mourning and fear. 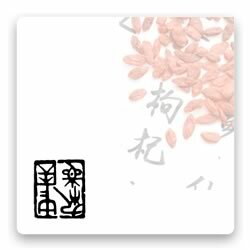 The four key terms to describe the seasons, sheng 生，zhang 長, shou 收, and cang 藏 are here translated in their most general sense, but it is important to remember that they each have a very specific meaning in the context of the seasonal cycle: Sheng 生 "birth," derives from the notion of "sprouting" as suggested by early versions of the character that literally depict a plant pushing up through the surface of the earth from underneath to form its first leaf. The earliest version of zhang 長 "to grow" or "to lengthen," depict a person with long hair. The character shou 收 "to harvest," is a combination of "threshing" with a hook or sickle-like object. In a larger sense it can mean to receive or "to gather in," and in the context of physiology or pharmacological action even to "draw inward," such as when it describes the process of Qi consolidation in a newborn baby. Finally, cang 藏, "to store" or "to hide"(as in "to conceal in deep grass," suggested perhaps by the grass radical) can also mean "to go underground," which is what most animals and plants do to survive the harsh cold of winter, like a bear in hibernation. And there you have it! The text then goes into just what these guide ropes and connecting threads are, how yin yang relate to how we come into being and how we leave, how yin yang generate the five dynamic agents and how this relates to the shen ming. This is basic physiology in that it is the foundation for how the cosmos, and hence life, works. How can we treat disease without knowing these basics? We cannot, says Huang Di. Therefore, as a practitioner and teacher who emphasises the importance of understanding the transmutations of yin yang, I welcome this text. The thoughtfulness and honesty here is inviting. There is never a sense of one translation being right or wrong, but only that a choice was made by her and that another choice could shed a different light on meaning. The material that follows this and her discussion of it gave me my first rounded-out sense of what the liu he 六合could actually be referring to and why. Sabine is a good friend of mine. She is not a doctor of Chinese medicine and yet, her intuitive and personal knowledge of the medicine is that of a true healer. She gets it in her bones. I know from my discussions with her that nothing delights her more than a Chinese medical practitioner reading what she has offered, gasping at a new discovery and then bringing that discovery into the clinic or classroom. I have made Humming with Elephants a required text for my students. In my classes I frequently quote it. I love my students to experience that the correct approach to Chinese medicine is that of a curious explorer, with the intention of clinical excellence always inspiring us onwards. Sabine leads us through this terrain expertly.